This one starts with a great idea: the main character is a young girl who is breaking all the slasher movie rules in an effort to attract the slasher so she can kill him. The twist: it's all done in one take, and done very well at that. This one was clever, funny, and impressive, and best of all you can watch the whole thing above! This was another slasher themed short with a different approach: while two sorority girls are trying desperately to escape an axe-wielding murderer, they end up arguing about who is the hottest girl who will likely get killed first. It's a really clever twist that plays on tropes and does some great character work in a short time. This was one of the funniest films of the festival! Another very funny film, but this one plays instead with the works of H.P. Lovecraft. Some old friends show up unexpectedly for a dinner party and find that one of the guests is Charlie, essentially Cthulu in a business suit. Much confusion ensues as the old friends are baffled by everyone else being calm, with one of the other guests even being smitten with the unspeakable horror that is Charlie. This short is a really wonderful mix of cosmic horror and upper class dinner party humor, and is something I never knew I needed in my life! "The Babysitter Murders" was one of my favorite films of the festival, although it was another play on the slasher genre (very popular this year). This exceptionally well done short gets a little meta as it uses a fake slasher movie-within-the-movie to mirror the protagonist, a babysitter who hears on the radio that there is an escaped mental patient on the loose. 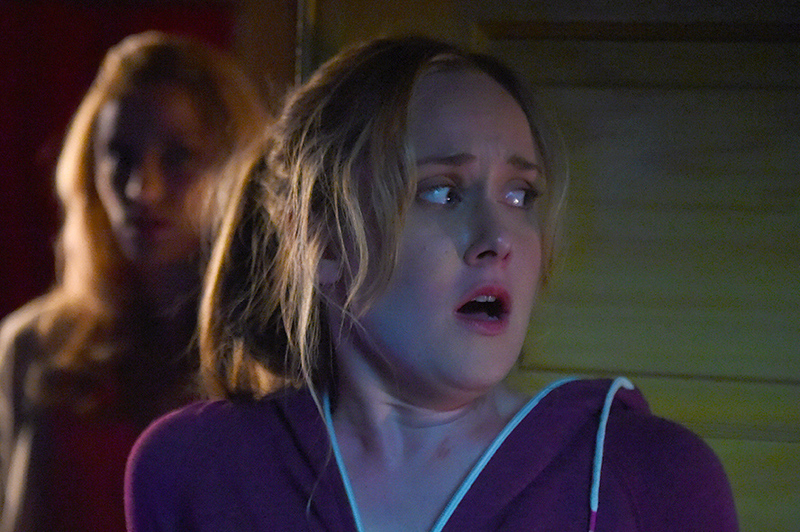 What follows is an expertly edited slasher with a wicked twist that really turns the whole thing on its head. It scratches the same nostalgia itch as something like Stranger Things does, and is stylish enough that it warrants multiple viewings. This might've been the most unique horror short of the festival, and definitely one of the most memorable. The concept is very simple: a woman wakes up to find herself on a strange, smooth concrete surface that has a steep curve down towards a dark pit. Through sound design alone, we are clued in that the pit is somehow sentient and has trapped others before. For the 10 minute running time of the short, the woman desperately has to find ways to cling on and not slide down, fighting the slipperiness of the blood on her scraped up hands and the oncoming thunderstorm. This was tacticle horror of a totally different kind than any of the other shorts, one of survival in an abstract situation. This one would really be at home as much in an experimental shorts block as it was here. Using a unique blend of stop-motion-like live action and black and white animated overlays, this short aims to tell a story of a couple who literally plug their heads into VHS recordings of their memories to try and rekindle their relationship. It is visually fascinating and pretty unique, and I'm a sucker for well-done experimental short films, so this definitely makes my list! They're running a pretty interesting campaign on their site with very cool behind the scenes footage, so check it out! "Mars IV" is only sort of a horror film, with its real roots in speculative science fiction, but it left a lasting impact on me. A French spaceship crew is taking part in a mineral study on Mars, and the discovery of a huge gold deposit creates a moral conundrum. Meanwhile, they are constantly encouraged by their robot to always leave their AR (augmented reality) on so they don't get "the red," a form of madness that claimed earlier crews. The film is really well designed and very well thought out, hitting a lot of interesting points in a short time span. With a slightly larger budget for CGI effects, I could see this becoming a very successful feature film. As always, I encourage readers to seek out and support short films by going to film festivals and donating to crowdfunding campaigns. Crowdfunding has opened up a whole new way for shorts to get funded, but there still isn't a better way to see them or discover new filmmakers than by going to film festivals! Look out for my picks for the best feature films in the coming days!